Can't get away this summer? Bring paradise to your backyard with inflatable rentals. 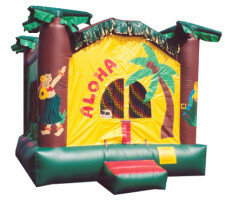 Our Aloha bounce is all you need to feel like you're digging your toes in the sand. And once you start bouncing, you'll feel like you're riding tubular Hawaiian waves.